May 31, 1909 -- Herriman's 'Guess Who' series continues; presumably the fellow buying cigars is the subject of this one. I don't recognize the caricature, but evidently he either runs a local boxing venue or manages local fighters. I found an end date for Vip's "The Captain's Gig" in the December 1, 1979 edition of the Pittsburgh Post-Gazette (it's on page 11). 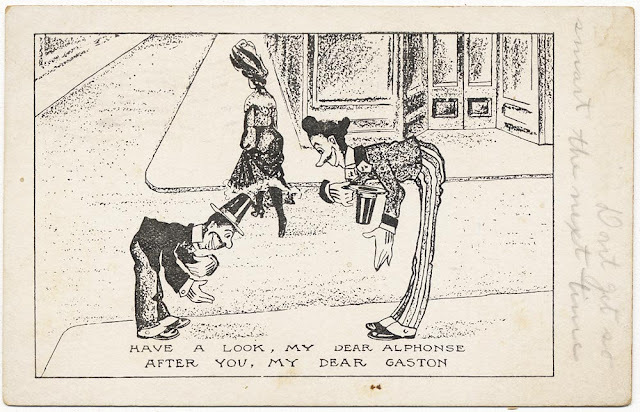 This postcard appropriates Fred Opper's famed Alphonse and Gaston characters to play in a gag that is a just a tad sexier than their usual fare. The cartoonist copied the two characters verbatim from Opper, but was inept enough that it is obviously faked. This cartoon, not even properly formatted for the card, actually appeared on several different variant postcard versions. There's even a version where the cartoon characters have been replaced with photos of costumed actors playing the parts. For obvious reasons, these cards do not offer manufacturer info. They are undivided backs, so prior to 1907. The four years beginning with August, 1909, spanned a course in journalism the scope, richness and variety of which surpassed all my expectations. It would have been impossible anywhere except under the leadership of W. R. Hearst. I became the confidant of publishers from Shanghai to London. Publication problems of the most intimate and complicated character were submitted to me for analysis. For weeks at a time newspapers were operated under my direction from the private offices of the owners without the knowledge of their subordinates. Either I dictated or scribbled the orders which the proprietors would thereupon transmit as their own. And all this activity was without formal responsibility of any sort, except as a game played in pursuit of an assignment from Hearst. Wads of humor strewed my way. A publisher, who began by repelling simple inquiries concerning his corporation set-up, would conclude by begging advice about a secret payroll. Another, who started with a protest that there wasn’t enough money in any one man’s hands to buy his newspaper, would wind up by urging me to fix the price. These transitions followed a common pattern of events. Usually, my errand opened with an academic query as to consequences that might ensue from the massing of the Hearst features in one local outlet. Since the question was purely hypothetical, it could be propounded with complete sincerity. It lit three fuses in the proprietor’s mind. Was Hearst actually considering invasion of the field? Was the vile competitor down the street trying to corner these specialties? Might it not be a good plan to “sew up” this opportunity at once? My reluctance to negotiate a contract whetted any eagerness that had been aroused. In nearly every case, this approach worked out an earlier and more authentic answer than would have been otherwise obtainable to the inquiry with which Hearst had charged me: Is this publication purchasable at a fair price? The canvass touched practically every city in the United States with more than 75,000 population in or near which Hearst was not already publishing a daily. Ultimately, it covered more than a quarter of a million miles of travel. I did not recommend the acquirement of one property. But in each of the newspaper centers I visited, there sprang up an avidity for the Hearst features. Probably, in many places, it had sprouted before my appearance on the scene. But the sprout budded into blossom shortly afterward. This led to a rapprochement with Farrelly. He was now in charge of the Hearst news services and syndicates. Meanwhile, probing the possibilities of newspaper acquisitions for Hearst brought to the surface a latent phenomenon of the American press. The publishing field was studded with misfits. In the first decade of the twentieth century, a large percentage of the dailies were in the hands of men congenitally disqualified for journalistic leadership. Others were deficient in technical training and information. Fumbling with fundamentals retarded constructive endeavor. Frequently, ulterior objects diverted energies from public to private aims. Servitude for special interests or even corrupt politics was often masked by spurious labels of devotion to the common welfare. No phase of my negotiations with publishers was more impressive than the eagerness with which many of them snatched at statistics that simplified problems of operation. While the dearth of this data was a damning commentary on the short-sightedness of the publishing craft, it afforded me no little amusement. The quotation of a few figures earned an inordinate respect in unexpected quarters. It sometimes led to tests and demonstrations calling for close supervision. It was in such cases that, to “prove my point,” I collaborated with or substituted for the proprietor behind the scenes in the actual management of his publication. The effect, in some instances, was embarrassingly successful. It invested me with an air of wisdom as unmerited as it was, on occasion, uncomfortable. Tempting offers—unacceptable if for no other reason than my contractual obligations—repeatedly bothered me. There were several proposals of partnership. Some of these propositions lost much of their flattery under the microscope. They reflected more the deficiencies of the proponents than any confirmed capability of the recipient. One of my most interesting negotiations was with W. J. 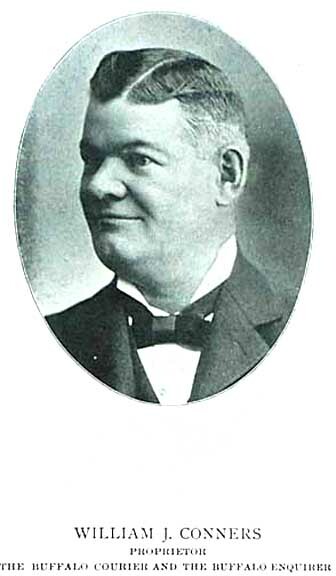 (“Fingy”) Conners, multimillionaire owner of the Buffalo Courier and the Buffalo Enquirer. He had brought the wits of his early years through the burnishing processes of the bar-room. “Fingy” was never satisfied with less than a proprietorial role. His climb upward began when he decided that he’d swap positions with the saloon-keeper—that thereafter he’d do the collecting instead of the spending. Conners was essentially a realist. It was he who gave utterance to that apothegm which has comforted untold millions by solving the chief problem of the parvenu—“Them as has ’em, wears ’em.” The diction is preserved to fix the chronologic significance of the message and to emphasize the definiteness and breadth of “Fingy’s” judgment at a time when cultural niceties had not yet cramped his freedom of expression. The observation disposed of an earnest protest from David S. Taylor, managing editor of the Buffalo Courier. On the way to attend his first formal function—the mayor’s inaugural ball—Conners stopped at the Courier office to exhibit the magnificence of a raiment he had never worn before. Taylor narrowly escaped gulping his cigar. The full-dress suit with tails was perfect. But from the broad expanse of “Fingy’s” shirt front blazed three diamonds of startling proportions. Taylor’s pleas against this display were waved aside with the gem of philosophy more precious than the stunning gems that Conners insisted on wearing to the mayor’s reception that night. Pride rather than profit was tied to the upper rungs of Conners’ newspaper ladder. His admiration for Hearst’s journalistic success bordered on the fanatic. His highest ambition at that time was to duplicate in Buffalo one of Hearst’s triumphs. All this should have smoothed out any possible wrinkle in my first visit to the Buffalo Courier office. Instead, it led to a hazing. Conners refused to believe the call was of my own choice. He felt certain I had been assigned to conclude a contract with him. He interpreted my refusal as a feigned reluctance. The culmination came in what was afterward described in one of Conners’ favorite anecdotes as a friendly lark. It was actually a detention by force. My wearing apparel disappeared in a Turkish-bath resort to which “Fingy” had inveigled me. Bribed attachés of the establishment, under Conners’ supervision, by various artifices kept me in seclusion until noon the next day. Then an elaborate document, meanwhile prepared by “Fingy’s” lawyers, was presented for my signature. It was intended to authorize the use in the Buffalo Courier of a list of Hearst features at what Conners regarded as an enormous price—$20,000 annually. Several years passed before “Fingy” secured any of these items. Warburton met me on terms of equal difficulty. He tried to fight off an ennui while I tried to ward off an hypnosis. His trouble was chronic. Mine was with the mesmeric effects of a massive gold bracelet. It was the first ornament of the sort that I had ever seen a man wear. Possibly a watch was hidden behind one of the links. I never found out. Warburton thought time could be saved by calling in one of his circulation experts to advise whether there was anything in my mission that really merited managerial attention. The Warburton minion came clad in a red flannel undershirt. Flannagan was his name. One of his first utterances knocked most of the elegance out of his master’s pose. The gold bracelet somehow softened the menace in Warburton’s movements when he locked the door of his office. A momentary resumption of patrician condescension was reassuring. Barclay explained, with a smile, that he was “only making sure we would understand each other.” Like Conners, he pressed upon me for execution a document hurriedly prepared by his attorneys on telephone instructions. It stipulated the right to publish in Philadelphia a schedule of “novelties.” A protracted argument ended when I attached my name over the words, “Signed without authority.” Of course, it was a worthless document. Between these encounters with Conners and Warburton lay a distorted reflection of the dispositions of their fellow publishers toward the Hearst procession. It was like the images in a suite of concave and convex looking-glasses. A vague annoyance ordinarily flickers through amusement over these mirrored grotesqueries. Here this annoyance was gravid with fear. Apprehension of an invasion of their field by Hearst nagged hundreds of owners of American dailies. Even “Fingy” Conners, with an intense eagerness to be Hearst’s client, winced at the mere thought of being his competitor. To hundreds of newspaper proprietors Hearst loomed like a Goliath with club raised to beat them into economic insecurity. The mixed feelings of those who received me as a representative of the most menacing figure on their business horizon, added spice to the work in hand. It gave special point to the development of relations with men who, at first distrusting my purposes, eventually sought to commit to me the management of their publishing activities. One of the most interesting of these was E. G. Lewis, then owner of the St. Louis Star. He had bought that property with profits from one of the oddest undertakings in the scope of graphic enterprise. It was an art league with an organ—a vigorous mouthpiece—the Woman’s National Daily. This publication attained a circulation exceeding 500,000. Lewis began the construction of an imposing community center— Universal City—on the northwest edge of St. Louis. One palatial marble edifice challenged worldwide architectural attention. Its main oddity consisted of wide central staircases projecting from the marble walls without visible supports. Lewis established what he described as the first mail-order bank in America. He estimated his quick assets in the tens of millions. An overabundance of cash led to his undoing. He decided to use some of it for the purchase of a forthcoming issue of St. Louis municipal bonds. Being an amateur, he didn’t consult the financial potentates. His bid for the flotation was startlingly higher than the average price offered by the local banking circle. That lacerated the feelings of the sensitive gentlemen operating the component arcs. It was merely a coincidence that these bankers enjoyed a close friendship with a member of the cabinet in Washington. He was Charles Nagel. He had been appointed from St. Louis by President Taft as Secretary of Commerce and Labor. It was perhaps merely a coincidence, also, that Mr. Nagel did nothing to prevent the issuance of an order by his colleague, the postmaster general, holding up all mail addressed to or by Lewis and his group of organizations. That put the quietus on E. G. Lewis’ affairs. Incidentally, it insured the St. Louis bankers against any further insolence from him. It was followed by a strange omission. The official records lack any legal decision that explains just why the postal department ruined E. G. Lewis’ business. A bit of over-zealousness on my behalf defeated the compulsion which might otherwise have required my attendance at Lewis’ downfall. He had proposed a yearly salary of $25,000 to edit his publications. The offer dazzled me. It meant more than a 200 percent increase of earnings. A recently signed contract with Hearst interfered. It was in my mind to ask for a release. Hugh K. Taylor, Lewis’ right-hand man, doubted that I would be sufficiently insistent. He decided to anticipate any hesitation on my part. Possibly he felt he would be more persuasive. He called on Carvalho. That disposed of the matter. Eighteen months later, while Lewis was raking the remnants of his grandiose projects, a federal court summoned me as an expert witness in appraisal of his two dailies. The occasion spurred conflicting emotions. It was questionable whether avoidance in a share of Lewis’ plight was due more to providence than to my own deliberation. Quite different from Lewis were those publishers who hoped to find in my overtures a means to dip into Hearst’s reputedly inexhaustible wealth. Most of these hoisted lightning-rods for partnership proposals. I submitted only one such suggestion. The vigor of Hearst’s rejection left no doubt about his attitude toward a divided domain. It is true that in various periods other men have held title to newspapers that really belonged to Hearst— Arthur Brisbane, Guy Barham, M. L. Annenberg, A. J. Kobler, and United States Ambassador Alexander P. Moore among them —in Washington, D. C., Milwaukee, Detroit, Los Angeles, Pittsburgh, New York City and elsewhere. But their proprietorship was fiction. Each could have testified correctly that he was the sole owner of the stock. He could have rightfully brushed aside any hostile inquiry designed to show that consummation of his ownership was dependent on liquidation of unpaid notes or mortgages. There were none. But Hearst had retained the power to regain complete possession at will. The trick was done with an option for purchase. Simultaneously with his endorsement of the stock certificates, he received a guaranty of his right to redeem the publication at stated terms. The figures represented no actual payment for the property. They were reckoned to provide a fee for the services of the dummy proprietor. This was automatically scaled by two factors—elapsed time and contingent profits of operation. This hocus-pocus—transparent to nearly everyone familiar with the background—was carried on in deep solemnity and in the conviction that it was highly important. It did serve several purposes. Foremost was the appeasement of space-buyers. No matter how comparatively cheap the rate, and despite superiorities either admitted or debatable, the Hearst newspapers generally encountered a greater sales resistance among advertisers than other first class American dailies. That was due to prejudice. Much of this bias could be traced to the slander, misrepresentation and misapprehension discussed earlier in these pages. But much was also due to a distrust among business men of Hearst’s political program. It was the vogue of conservatives to denounce him as a sensational radical. That vogue imposed a serious handicap on Hearst’s space-selling staffs. It was particularly bothersome in cities in which he published two separate dailies. Advertisers, reluctantly using one of the units, backed up against “spending money twice in the same place.” Of course, it wasn’t “the same place.” But it was the same publisher whom they didn’t fancy and who was soliciting a double instead of a single patronage each day. 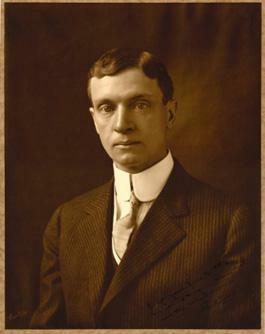 When Hearst, having established the Examiner in Los Angeles, decided to buy the Herald in that city, he persuaded his close friend, Guy Barham, to pose as the purchaser. That was the most successful of Hearst’s camouflaged deals. In New York, when he determined to launch a tabloid daily, he was already publishing the morning American and the Evening Journal. The newcomer —the Mirror—fought its way toward success under a series of synthetic proprietors, including A. J. Kobler and Alexander P. Moore. Two dailies in the same field—one morning and one afternoon —were operated under a frankly single ownership in more than a score of different communities. Interesting examples have been the newspapers owned in New York City by Bennett, Dana, Pulitzer or Munsey; in Boston by the Taylors or Winslow; in Chicago by Lawson; in Kansas City by Nelson; in Minneapolis by Murphy; in Detroit by Scripps; in Wichita by the Murdocks; in Des Moines by Cowles; in Columbus, Ohio, by Wolfe; in Louisville by Bingham; in Birmingham by Hanson; in San Antonio by Huntress; in Springfield, Mass., by Bowles; in Baltimore by Abeles or Agnus. If any of them thought of shifting the label of paternity of one of their publications, the idea was not carried out. It remained for Hearst to hide proprietorship under a makeup of false whiskers and wigs. It would be impossible to determine whether the average of results obtained with these disguises was higher than that of unmasked operations. Scouting for bargains in newspaper properties by my method was not without stumbling blocks. It entangled me in several awkward difficulties. On occasion, the statements of a manager differed materially from the independent audit prepared at my instance. Once, the friction resulting from this sort of a snarl was ironed out with data that I produced by actually operating the plant for a brief period. Demonstrations, described in earlier paragraphs, along lines dissimilar, but parallel, thrust upon me successively the Toledo Times, the Columbus (Ohio) News, the Cincinnati Commercial-Tribune and the Rochester Herald, either for a spin of the wheel openly or for a secret collaboration with the publisher. At Toledo, it became apparent that the lovable personality of George W. Dun would prevent the reorganization essential to any quick drive forward by his paper. 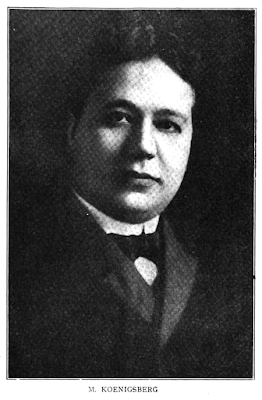 In Columbus, amiable Allen Diehl Albert agreed that he should move his talents to more important engagements than his hopeless task with the News. That paper subsequently verified my judgment by collapsing. In Cincinnati, E. O. Eshelby finally admitted that he was wasting my time in an attempt to extricate the Commercial- Tribune from a predicament beyond mastery. That posed a riddle the solution of which was limited to a narrow inner circle. The explanation lay in the hidden strategy of John R. McLean, owner of the Cincinnati Enquirer. This was the McLean of uncounted millions who invaded the New York arena and turned tail, selling the New York Journal to W. R. Hearst. At his death a decade later, he was the owner of both the Cincinnati Enquirer and the Washington Post. McLean would not have permitted the Commercial-Tribune to pass under direction that might complicate the Cincinnati morning field. Strings by which that newspaper was made to dance to his tune were manipulated under cover. The Enquirer could prosper in security while the tempo of its competition was satisfactorily controlled. At Rochester, Louis M. Antisdale declined to accept my conclusions concerning his newspaper, the Herald. He wanted to discuss the situation with Hearst. I arranged a meeting between them. It was fruitless. Antisdale demonstrated tremendous tenacity. Fifteen years passed before the Rochester Herald went into bankruptcy. The Rochester Democrat-Chronicle bought the remains. In addition to a long string of successful humor books, the great Don Herold did a lot of newspaper work. Problem for me here at Stripper's Guide is that Mr. Herold often wrote illustrated columns, which don't fall in our purview. 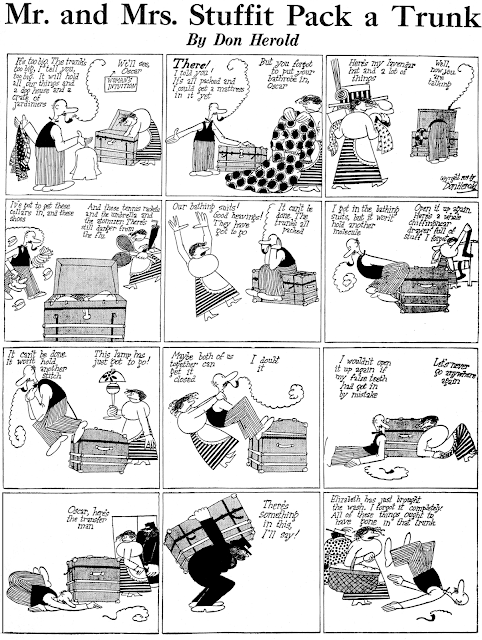 Therefore, a decade or so into this blog and I still haven't had much of a chance to wax rhapsodic over one of the truly great cartoonists. Herold is one of those guys who just plain draws funny. Along with the likes of VIP and Milt Gross, who can make you crack up even before reading the gag, Herold can take class-B material and turn it into the humor event of the week. And a lot of Herold's material was definitely class-A stuff, so that is quite the powerful 1-2 punch. Just look at the second sample above, in which Herold trots out one of the creakiest old jokes; so ancient that the original may well have been drawn with a stylus on clay. His deceptively simple drawings, which at first blush may seem almost childlike, have more energy, grace and humor than all the noodling and anatomical rendering in the world could accomplish. The page's subject was whatever Herold happened to dream up in any given week -- there were no continuing characters. There was also no unifying title, just a different headline each week. The page sometimes collected a group of vignettes like our upper sample, sometimes was a full-page strip as in the lower one. Although I'm sure it would look spectacular in color, as far as I know it only ran in black and white. I believe this Sunday series, which ran from September 29 1918 to July 11 1920, is Herold's first of only two purely cartoon series he did for newspapers. It was syndicated while Herold was in the employ of the Indianapolis Star, and I'm not sure if the Star did the syndication or if Herold sold it himself. Herold's copyright is prominently lettered onto each page, so maybe he did self-syndicate; he was a good businessman so it's a definite possibility. The Star itself stopped running the page in January 1920, and the page kept going for another six months in syndication, so that's another bit of evidence that points to self-syndication. Thanks to Cole Johnson for the scans of the samples. John W. Jarvis was born in Geneva, Illinois, on July 3, 1918. Jarvis’s birth date is from a family tree at Ancestry.com, and his birthplace is based on his father’s World War I draft card which said he resided n Geneva. The 1920 U.S. Federal Census recorded Jarvis as the only child of Frank and Estella. His father was an agent for a tea company. The trio lived in Geneva at 1030 First Street. The address was the same and Jarvis had a brother, Francis, in the 1930 census. During World War II, Jarvis enlisted on June 2, 1942. American Newspaper Comics (2012) said Jarvis drew Inklings for WNU from December 25, 1947 to February 23, 1950. 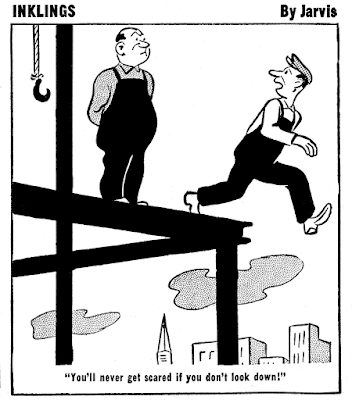 He also produced Mayor McGup, from 1948 to 1955, for the National Weekly Newspaper Service. SUL said Jarvis was laid off and he returned to Geneva. 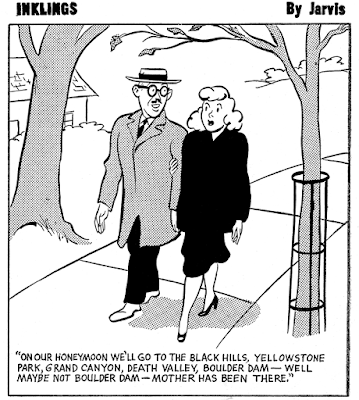 In 1953 Jarvis went to work at the Aurora Beacon News where he drew editorial cartoons and advertisements. The Chronicle said Jarvis retired thirty years later. The 1956 and 1958 St. Charles, Illinois city directories listed Jarvis as a cartoonist at “29 Oak G”. 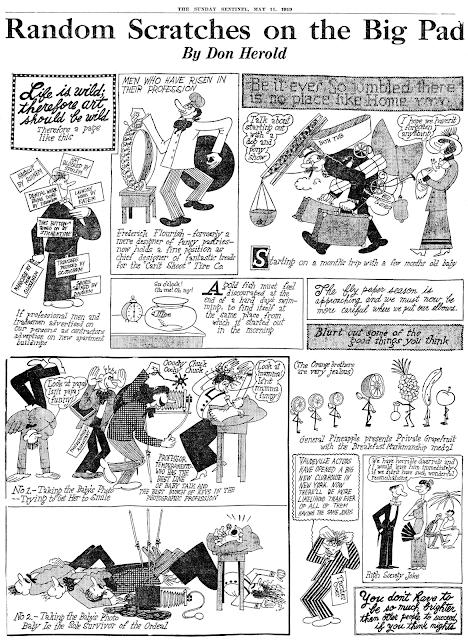 Jarvis’s cartoons appeared in the Saturday Evening Post, Colliers, Parade, Look, Esquire and others. The Daily Herald (Arlington Heights, Illinois), May 7, 2006, said Jarvis and artist Al Ochsner held a cartooning workshop “Geneva Toons” for children in grades sixth through 12. His art was shown at the Geneva History Center as part of the “Art and Artists in Geneva’s History” exhibit. Jarvis passed away October 30, 2015, in Geneva, according to the Chronicle. what if anything can you say about Fred Zumwalt? 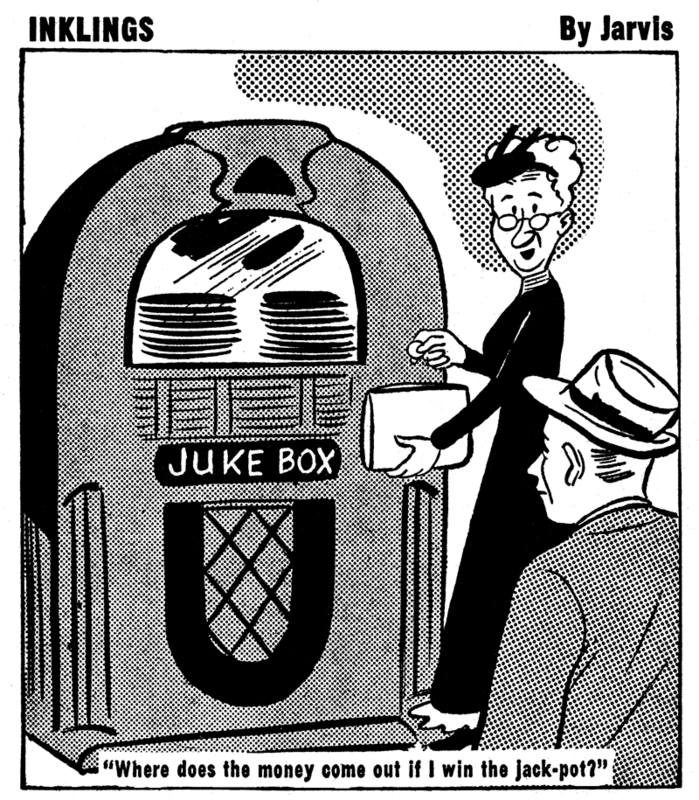 One of the Holy Commandments for newspaper syndicates back in the mid-century era was Thou Shalt Have a Magazine-Style Gag Panel Feature. Western Newspaper Union dutifully fulfilled the requirement with Inklings by John Jarvis. 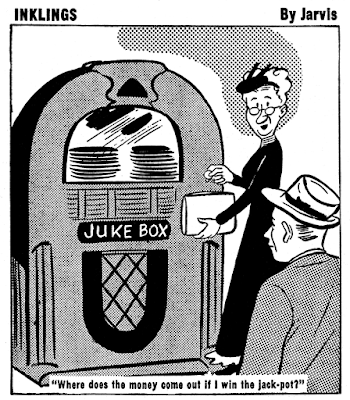 Inklings was reasonably well drawn with reasonably funny gags, and ran for a reasonably long time in a reasonable number of WNU weekly newspaper clients. Inklings was brought on board by the syndicate on the week of August 21 1947, and was dropped on the week of February 23 1950, as near as I can figure. These look very similar in style to the faux-cartoons by "Kalo" featured in Seth's classic It's a Good Life, If You Don't Weaken.